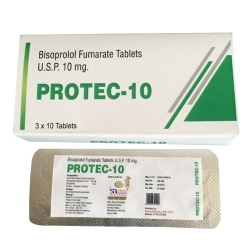 Bisoprolol is used alone or together with other medicines to treat high blood pressure (hypertension). High blood pressure adds to the workload of the heart and arteries. If it continues for a long time, the heart and arteries may not function properly. This can damage the blood vessels of the brain, heart, and kidneys, resulting in a stroke, heart failure, or kidney failure. High blood pressure may also increase the risk of heart attacks. These problems may be less likely to occur if blood pressure is controlled . This medicine is a beta-blocker. It works by affecting the response to nerve impulses in certain parts of the body, like the heart. As a result, the heart beats slower and decreases the blood pressure. When the blood pressure is lowered, the amount of blood and oxygen is increased to the heart .